I must share that this meal was new to me in both taste and preparation, a classic comfort food and apparently the ultimate in hangover cures. Bring a pot of water to the boil, adding a dash of turmeric and pinch of salt & pepper, once boiling carefully lower in your eggs into the water and reduce to a low heat for 6 mins , then adding in your rice for a further 2 mins. Lay your fish (haddock is traditional, but try snoek for a treat) into a shallow saucepan, pouring in some milk and adding in a couple bay leaves and peppercorns, covering the fish completely. Place on a high heat and reduce to a simmer for 4-5 minutes till the fish is cooked through. After the eggs have had their 8 minutes, remove them from the pot and let them cool, drain the rice and put to one side. Using a slotted spoon, place your fish onto a plate, removing the skin and any remaining bones. Slice up an onion, some fresh ginger and deseed a red chilli, rinse the rice pan and put back onto a medium heat with some butter, adding the ingredients for 10-12 minutes, stirring occasional. Pound some fresh coriander and cumin seeds in a pestle add mortar with a pinch of salt & pepper, stirring them into the pan of onions. Pour your milk through a sieve to remove any contaminants, pouring 150ml of the liquid into the pan of onions with the rice, the fish and lay atop your quartered eggs. Pop the pan back on the heat and simmer for 5-10 minutes until the dish is hot through and most of the milk has been absorbed. 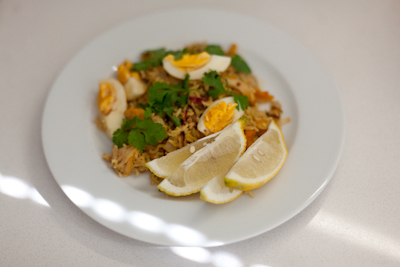 Cut a lemon into wedges and served them aside the Kedgeree and garnish with fresh coriander. Okay, so that is quite alot to take in, and while it may be a hangover cure I’d certainly not want to attempt this while under the influence! It has a very unique taste and texture and is one of those dishes you will love or hate, thankfully I’m of the former opinion. Have always wanted to try this, yours looks so fresh with the lemon wedges.